Today we are featuring Kerry O’Connor, Senior Communications Manager at Einstein Healthcare Network. Kerry has been a PPRA member for nine years and has been working in the PR field for 18 years. As an avid writer Kerry has a passion for telling stories. PPRA: Kerry, tell us a bit about your background and your current job. KO: Since graduating from La Salle in 1998, I’ve been working in Public Relations. It’s a career born out of necessity. As a credentialed but broke journalist and photographer just out of college, I started working in PR as a way to keep the lights on between newspaper assignments. PR or writing…I just like to tell stories. KO: At Einstein Healthcare Network, I work for a variety of service-lines and network initiatives, like our 150th anniversary campaign this year. But, the bulk of my work is for MossRehab, Einstein’s physical and cognitive rehabilitation facility, which I really enjoy. There’s always new technology and new methods that truly help people with disabilities. I’m working on some fun stuff right now, including our #BornAtEinstein campaign–a crowd-sourcing initiative to collect pictures and stories of people who had their kids or who were born at an Einstein hospital over our 150 year history: BornAtEnstein.com. I’m also putting together MossRehab’s sponsorship of the GlobalAbilities wheelchair racing team for the Broad Street Run and spearheading MossRehab’s involvement with They Will Surf Again in June–a one day surfing event for persons with disabilities. They Will Surf Again is a great example. I surf, so I volunteered. When I came to Einstein/MossRehab, I thought it was the kind of thing MossRehab could be involved in and my leadership in PR and the leadership at MossRehab said “Go for it!” This June will be our fourth year. We’ve sent down over 150 volunteers so far and we’ve gotten lots of great publicity. This year our art therapy program is working with the Philadelphia Museum of Art to create graphics for a surfboard to be used at the event. All because leadership was/is willing to hear ideas. You can’ take that for granted. KO: The #BornAtEinstein campaign that is running till the end of this year. We’re asking Philadlephians to take the time to find baby pictures and share them, along with their often-times very personal stories about their experience at Einstein and people are sharing them. We have over 500 submissions so far, ranging from people who were born at an Einstein hospital in the 20s to babies that were born a few days ago. The Hospital Association of Pennsylvania is highlighting the campaign at their annual PR conference in April. KO: Never take the first no as the last no when trying to do something new. A few adjustments–and a little tenacity–may be all it takes. KO: Movies: Casablanca, Jaws, Goodfellas…and my guilty pleasure, Captain Ron. Books: I love Hemingway. I’ve read his novels and short stories a ton of times. KO: The Blue Horizon on Broad Street. When I started writing sports features, I covered a lot of boxing matches there. It’s closed now. But, if I’m honest, my favorite all-time Philly spot is probably XIX Nineteen. Had my first date with my wife there. Proposed there. Now we have a three year-old son. That place is the epi-center for my happiness. When I lived in Manayunk, I loved Delassandro’s. But, I gotta say, a heart-attack wit’ (provolone, american, whiz in a hollowed-out roll) from Pat’s is pretty spectacular. There is no doubt the first month of 2016 both started and ended with a splash for me. Literally. After reading I Dare Me, Lu Ann Cahn’s witty and wonderful book of candor and inspiration, I informed her how moved I was by her story and she invited me to join her exactly where her book began – at the Polar Bear Plunge in Atlantic City, NJ. First, let me explain the premise of her book. Though a survivor and highly successful and well-known investigative reporter with a loving family and fruitful life, Lu Ann was feeling stuck and her daughter Alexa convinced her to do a daily first – something new every day – for an entire year. These “firsts” turned into a blog and then a book, which is continuing to impact lives one page at a time. Throughout January I engaged family, friends and co-workers to help me come up with new ideas to add to my list of “firsts.” The ideas were only accepted and added to the list if they were beneficial to my mind, body, soul and/or career and did not conflict with my core values (ie: faith, morals, beliefs, etc.). Therefore, I had to reject the dare to only drink Mountain Dew for a day and the dare to kick my feet up on my boss’ desk. Some firsts can lead to lasts. Day 11 – Pay for the person behind me in line. Day 12 – Substantively compliment three strangers. Day 14 – Blow bubbles to greet speakers. Day 17 – Give relationship advice to a stranger. Day 21 – Attend a judicial swearing-in ceremony. Day 24 – Swing at the playground in the snow. Day 25 – Meet three moms and give them flowers. Day 27 – Attend a Turning Points for Children meeting. On January 31, I ended my first month of “firsts” back where I started – in the water. I worked through fear of claustrophobia to successfully complete a 90-minute sensory deprivation float. (If you have no idea what I am talking about, Google it.) It was as reinvigorating as the plunge was, though thankfully it was much, much warmer. This whole experience of doing something new every day has given me a fresh appreciation for life. It has allowed me to communicate and bond with strangers in meaningful ways, remember the fun and importance of playtime and step out of my comfort zone on a frequent basis. In PR, we need the skills of having the courage to go up to strangers and the compassion to connect with people from all different backgrounds. Our toolbox of skill sets can be as vast as the diversity of clients and industries that we represent. In sharing all of this with you, I encourage you to challenge and dare yourself to complete significant “firsts” that will stretch you and allow you to grow both personally and professionally. Lastly, I kindly ask that you share suggestions and/or opportunities for “firsts” with me. Tickets to a new show or exhibit? Client opening a new restaurant? Access to a behind-the-scenes tour? Looking forward to sharing many more “firsts” with PPRA. Meredith Z. Avakian-Hardaway is president of the Philadelphia Public Relations Association and director of communications and marketing at the Philadelphia Bar Association. Connect with her on LinkedIn or follow her on Twitter at @MZApoetry. Working in public relations is as exhilarating as it is demanding. I can say with assurance that no two days are alike and that a career in this field promises to keep you on your toes at every turn. 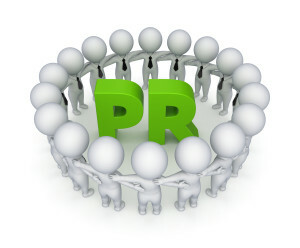 Most would agree that PR is for those who prefer to create their own destinies, blaze their own trails. There’s plenty of opportunity for this in our field, and that’s why we love it, right? Sure, but as much as PR allows us the creative freedom to come up with ideas that’ll knock the socks off of our key audiences, PR is very much a team sport. Here are the top five ways. In nearly all organizations, there is a segment of the team dedicated to one audience and one audience only: the customer. Since, ultimately, it’s the job of the PR person to attract more of them, you better believe that the customer service team is a key player in the success of the PR team. No need to be a mind reader when your fellow team members are talking to the customers day in and day out; getting to know their needs, their wants, their pain points and so much more. So what do you do? Turn that information into fuel for awesome PR campaigns and strategies. Once you’re ready to implement a campaign idea, it’s likely that you’ll want some creative assets to go along with it. In the visual storytelling age in which we now find ourselves, having a talented graphic designer on your side is priceless. Whether it’s creating an image to add to your press release or turning facts and figures into a beautiful infographic that can be shared across the web, a graphic designer can add tremendous value to the success of a PR team. Speaking of stats, nowadays we have more and more companies with a dedicated team member (or an entire team) who simply does data all day long. This is great news for the PR team because we all know journalists love data. Everything from customer trends and company growth to website traffic and Google Analytics; the data guys and gals are on it. Another reason you want to stick by the data miners is to help show and tell the value of PR and how it’s impacting the bottom line. For more on this subject, check out the previous blog post Communicating the Value of PR: Stop Dodging, Start Measuring. As PR people, we’re usually fielding media requests and coordinating interviews for others. Whether you’re on an in-house PR team or on the agency side, collaboration with your internal experts and thought leaders is a must. Successful teamwork requires more than just setting up time with reporters. It means collaborating on story ideas and PR opportunities that match the person’s expertise and that align with the organization’s goals and key messages. Finally, we sync up with journalists to bring value to our respective audiences. Media pitching an idea and working with a reporter to bring a story to life requires input that meets the needs of both sides. On the one hand, reporters have a story to tell. On the other, PR pros have key messages to deliver to their target audiences. The happy medium is a story that adds value and brings something new to the audience. What are some of the other ways you see PR as being a team sport? Would love to read about them in the comments section!